Top and Base sold and shipped separately—ORDER BOTH. Premium-grade veneer for long-lasting good looks. Solid wood reeded edge is both durable and stylish. Space-saving design seats up to 8 people. Combining veneer elegance with modular format versatility. Ideal for everyday commercial applications, this premium-grade veneer table top delivers the long-lasting good looks of solid wood. Extra thick for added strength and support. Beautiful reeded edge is both durable and stylish. Efficient space-saving design seats up to 8 people comfortably. Part of the expansive Verona Series which features a variety of modular components to meet all your storage and conferencing needs. Top and Base sold and shipped separately—ORDER BOTH. 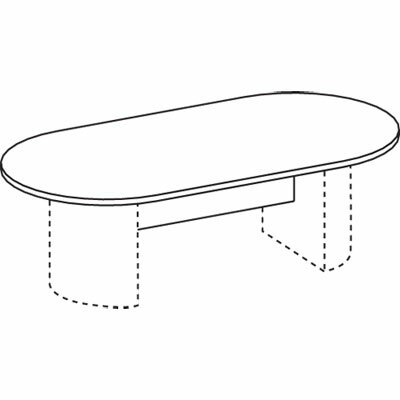 For Use With To create a racetrack conference table, you must order both the table top: ALE-RN71-9645MM & the table base: ALE-RN71-3015MM. Disclaimer Statement(s) Top and Base sold and shipped separately—ORDER BOTH. For Use With To create a racetrack conference table, you must order both the table top: ALE-RN71-9645CM & the table base: ALE-RN71-3015CM.